Set in the heart of the Humberside Peatlands, Hatfield Moor and the National Nature Reserve, the Tyram Lakes Hotel & Spa delivers over a 100 luxury rooms, fine dining restaurant, conferencing and meeting facilities, pool, superior spa and picturesque party and wedding venue. Suites and a top floor bar provide panoramic views of the lakes and countryside beyond. Conferencing in the countryside will be a perfect space to free the mind and think those big ideas. The spa will feature an outdoor, and indoor swimming pool, six treatment rooms, and deep relaxation spaces. Guests will also be able to enjoy wild swimming in the lake. 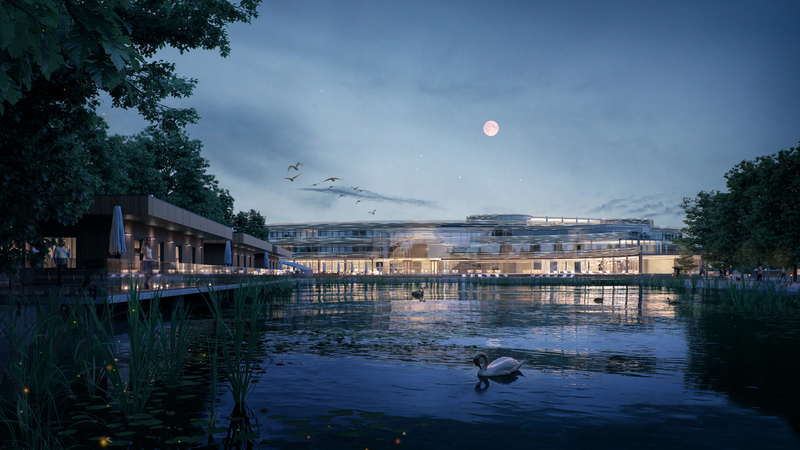 The proposed hotel sits respectfully on the site flowing around the lake shores curvatures. Regarding its materiality, a contemporary high-tech solution is proposed for the facade and the structure. The proposed materials apart from curtain walling will be mineral based and their texture and colour will make reference to the local vernacular architecture and local materials such as York stone.